Ameren Illinois is asking the Illinois Commerce Commission (ICC) to allow it to break commitments made as part of the Future Energy Jobs Act, which became law on June 1, 2017. In a recent filing to the ICC, Ameren has proposed a four-year plan that falls short of the new legislation’s energy efficiency savings goals by 27 percent. At the same time, ComEd filed a plan that will meet – and possibly exceed – their energy efficiency targets. Lowering their targets below commitments made just seven months ago actually allows Ameren to collect a $36 million bonus for exceeding them, gaming the system that was adopted to provide incentives to utilities for going beyond agreed-to goals. If Ameren’s request is granted by the ICC, their customers in central and southern Illinois will pay higher energy bills and lose out on job creation and economic development benefits associated energy efficiency. This will hit low-income communities particularly hard, since the new law requires substantial investment in economically disadvantaged communities. Plus, energy efficiency is one of the best ways to reduce the use of energy – including energy generated from coal-fired power plants that releases harmful pollutants and climate-changing carbon emissions into the air. Don’t let Ameren Illinois go back on their Future Energy Jobs Commitments! And don’t let them meet their commitments by reducing programs and incentives for low-income communities instead of reducing overhead costs. Models developed by the Illinois Clean Jobs Coalition show Ameren can meet their goals without sacrificing one of the key pillars of the Future Energy Jobs Act. Ameren Illinois needs to follow through with commitments made as part of the Future Energy Jobs Act. Modeling by Illinois Clean Jobs Coalition analysts shows Ameren can easily reach their targets. Their research shows Ameren is spending too much on overhead and administrative fees, rather than providing efficiency incentives to communities. That means higher bills for all customers – but especially low-income customers. Submit a Comment in Writing – File a public comment with the Illinois Commerce Commission here on or before September 12, 2017. Make sure you emphasize that Ameren Illinois should be required to meet its energy efficiency targets without reducing commitments it has made to low-income communities. Click here for a sample comment. Submit a Comment in Person – You can provide testimony at an upcoming Illinois Commerce Commission meeting, joining others who care about maintaining the energy efficiency provisions of this act. Call Pam or Lan at 217.607.1948 and we’ll make sure you have details and training. Also, you must notify the ICC at least 24 hours in advance of the date you plan to testify. You can submit notification of your testimony by either email or fax. On June 1, 2017, the Future Energy Jobs Act (FEJA) became law in Illinois. The crux of the bill is about getting smarter on how we generate, consume, and think about energy in Illinois. Between now and 2030, about $200 million per year will be made available to drive the construction of massive renewable energy and energy efficiency projects, making Illinois a top clean energy state. Energy has been one of the most potent policies the State of Illinois has adopted to curb climate change. Because it reduces our use of coal, it lowers climate-changing carbon dioxide. Reducing our use of coal-generated power also improves our health by reducing hazardous toxic wastes that pollute our air and poison our waterways. 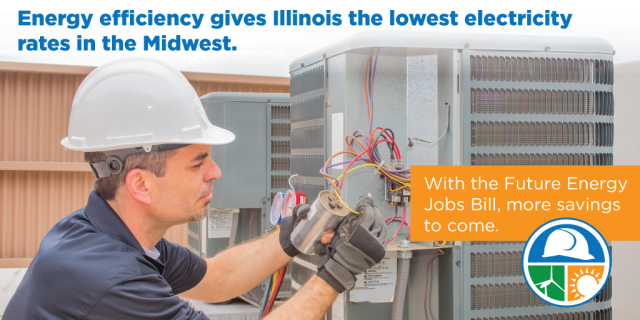 And energy efficiency creates jobs that stay in Illinois. Build a local clean energy workforce of more than 85,000 jobs state-wide. Save consumers two billion dollars. Bring about the lowest electric rates in the entire Midwest. This new law puts ComEd and Ameren Illinois in charge of the energy efficiency programs, and gives them returns on their investment via bonuses (and penalizes them if they don’t). ComEd is required to reduce their energy use by 21.5% by 2030, and Ameren by14.5%. Each utility must invest in economically-disadvantaged communities and public sector buildings. This new program is expected to begin January 2018. Ameren’s proposal to lower its targets as part of their ICC filing breaks commitments made just seven months ago. ComEd, with it’s higher targets, submitted a proposal that meets or exceeds their agreed-to commitments. Models carried out by the Clean Jobs Coalition show that Ameren, too, can meet its targets, without sacrificing programs that benefit low-income communities. Call Pam or Lan Richart, 217.607.1948 (office) or 773.556.3418 (cell).